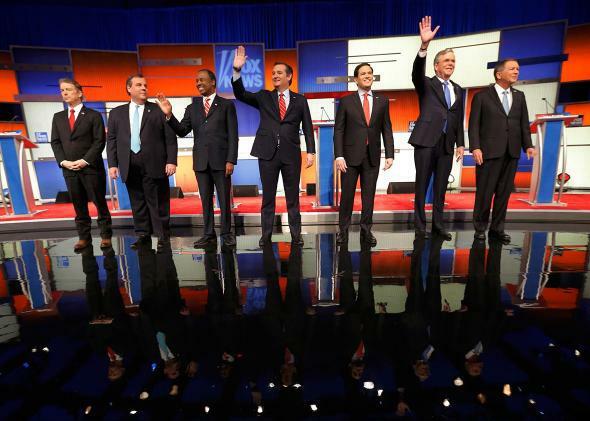 The best lines and quotes of the Fox News GOP debate. For months, the mere presence of Donald Trump has turned the normally dull GOP debates into must see television. Producing a steady stream of insults—and showing off an array of contorted facial reactions—he’s offered up some of the most memorable moments in recent electoral history. Tonight, however, he’s declined to appear, citing the supposed biases of Fox News moderator Megyn Kelly. Will his absence raise the level of discourse between his opponents? Or will others step in to fill the absurdity vacuum? Either way, we’ll be rounding up the evening’s best lines here. I kind of miss Donald Trump. He was a little teddy bear to me. The bulk collection of your phone data, the invasion of your privacy did not stop one terrorist attack. I don’t think you have to give up your liberty for a false sense of security. When we look at this bulk collection, the court has looked at this. Even the court declared it to be illegal. If we want to collect the records of terrorists, let’s do it the old fashioned way. ISIS wants to trigger an apocalyptic showdown in Syria… They are not going to go away on their own. They are not going to turn into stockbrokers overnight. They need to be defeated militarily and that will take overwhelming U.S. force. What we need is someone on that stage who has been tested, who has been through it, who has made decisions, who will sit in the chair of consequence and can prosecute the case against Hillary Clinton on that stage. A debate is a policy issue, but I will say this: Gosh, if you guys ask one more mean question, I may have to leave the stage. It’s best not to talk anymore about back door encryption. It will be solved, but it needs to be solved in the situation of the White House. We need to make sure… we don’t unfairly incarcerate another generation of African-American males. In Ferguson, for every 100 African-American women, there are only 60 African-American men. Drug use is equal between white and black, but three out of four people in prison are black or brown. I believe Puerto Rico ought to have the right of self-determination. If I was a Puerto Rican, I would vote for statehood. The fact is, we work for the people, the people don’t work for us, and we have to have an attitude when we’re in government of servanthood. [Until] we can prove to the people of this country that illegal immigration is under control, nothing else is going to happen. We are not going to round up and deport 12 million people but we’re not going to hand out citizenship cards, either. This is the lie that Ted’s campaign is built on… that he’s the most conservative guy and everyone else is a RINO. The truth is, Ted, throughout this campaign you’ve been saying or doing anything to get votes. If you’ve got ten people coming to your house and you know one of them is a terrorist, you’re probably going to keep them all out. You know, we probably have to figure out a way to make sure that we keep America safe. Bernie Sanders is a good candidate for president… of Sweden. The mentally ill, they’ve been stepped on for too long in this society and we’re beginning to treat them. In terms of my faith, look, when I study scripture I know people live in the shadows need a chance. I’m not deciding anybody has to make these decisions the way I do on the basis of what I do. But the time has come to stop ignoring the mentally ill in this country, begin to treat them, and get them on their feet. I think we ought to give Ukraine offensive weapons and I think we ought to fight them on the economic basis because Putin is a one-horse country, oil and energy. I do think… if any CEO in our country did [what Bill Clinton did] with an intern, with a 22-year-old, 21-year-old intern in their office, they would be fired. They would never be hired again… And the thing is, she can’t be a champion of women’s rights at the same time she’s got this that is always lurking out there. This post was updated througout the debate.